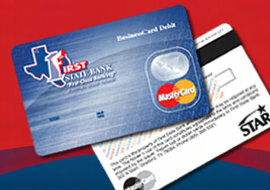 Enjoy the convenience and purchasing power of a credit card, without the steep finance charges. Linked directly to your checking account, the MasterCard® Business Debit Card lets you make purchases, shop online, and pay bills at no charge. The MasterCard® Business Debit Card has higher limits than before, plus you can set up additional cards with customized credit limits for your most trusted employees. In order to provide the very best protection for our customers, First State Bank has opted to block foreign usage of our ATM/Debit Cards. If you plan to travel out of the country, or wish to use your card to make foreign purchases, please notify First State Bank. Exceptions may be made on a one-on-one basis. This decision was made to protect you from possible fraudulent activity on your account. With the growing sophistication of electronic payment fraud, there is an increasing awareness of the need for vigilance on all fronts. You can feel confident that your transactions— even at an ATM—are monitored by some of the most advanced and integrated fraud detection systems available. Your transactions come with the peace of mind of around-the-clock account security.